Yet another Brexit trade! 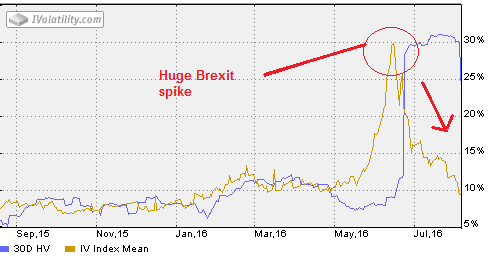 This is an interesting medium term trade idea – betting that the current hype around June 23rd Brexit poll in the UK is overstated. For the record personally don’t think that United Kingdom (uk) would vote for an eu exit. However there was a poll last Friday that had the leave campaign 10 points ahead. Therefore due to the perceived risk of an exit the pound and stock markets sold off. Happily for our proposed trading strategy the implied volatility of the options has gone through the roof. Typically on average implied volatility on options is overstated – and especially for know binary events (like stock earnings or polls). Therefore is makes sense to look at selling options, however with a potential huge move in event of a leave down you would not want to have unlimited risk. The aim is to “safely” sell premium without being on the hook for significant out sized moves of unknown magnitude. There is still time to do a similar Brexit trade before Jun 23rd this week, as the option will likely remain highly bid up in price into the announcement. Typically with a 30 day rule would like to give ourselves some wiggle room to exit the trade after the 30 day period has elapsed. This typically means a minimum of a couple of weeks after 30 day period to allow a strategic exit. Is it possible to do options with only (for example) 32 days to option expiration, but then you have only 2 days at the end for trade exit and you end up very close to option expiration where the gamma risk is very high. We could wait for August 2016 cycle to appear after this June 17th option expiration, but we’d like to get trade on this week as implied volatility looks quite rich. This Brexit trade is focused on the markets expectation of big move on the announcement itself. The assumption is that result is “stay” (status quo) and that after the announcement the implied volatility of the options reduces and the pound ultimately settles in a range after the announcement. It is important to recognise that the trade could instantly lose money on the announcement but this is capped due to the limited risk nature of an iron condor. There could be a lot of movement in the spread but the bet is that over about 30 days the pins will be in a similar trading range between 1.30 on down side and 1.46 on up side. If there is a sustained violent move in either direction this trade will lose. However according to option pricing on order entry it is has 60% probability of finishing inside the defined range by option expiration, so probability is higher to take a profit at some point during the trade lifecycle. After 30 days and up to 90 days it could move around inside the range if volatility collapses after the announcement as expected it could make money even if it trades outside the range, due to lower option premiums due a volatility crush. There are a lot of variables that make taking a profit on the trade a possibility between now and September. 1) purchase a new cheap put vertical otm (to neuralise any downside risk from the existing short put spread). 2) sell a put spread closer to the money to bring in more credit. This would increase the credit received AND make the trade initially more price direction neutral. However given that this Brexit trade is limited risk reward it does not HAVE to be adjusted. If goes massively against us initially on the announcement we may have to be content with taking close to max loss. in a very extreme directional move (either way) sometimes there is no good adjustment with an iron condor. Therefore there is some risk that can’t be predicted, however is it limited to the known max loss on trade entry – as long as you are comfortable with the initial risk you shouldn’t have to worry too much about this trade over the actual announcement. FXB options are pretty lightly traded and typically have low volume and open interest. Trade entry is always extremely important to the overall iron condor strategy, but very important in more illiquid products. The best strategy is not to rush into getting filled as soon as possible – the trade duration is 90 days so the iron condor pricing will typically not move that significantly in one trading day on options that are that far out in time. It is very important not to use a market order for this trade because you will get killed on the execution price. A good approach is use a day limit order to enter the iron condor, then cancel and correct if multiple times to get close to best available price. One of the interesting things we have noticed getting filled on illiquid options is that sometimes you can fills above what is considered fair mid price. So it is a good idea to start about 10% over fair value and work down in $0.01 or $0.02 increments. For example of the mid point credit offered is $4.00, start at $4.40 and work down towards $4.00, then keep adjusting down until you get filled. When you get close to mid price and the order hasn’t filled yet, you can leave an order in there for a few minutes to see if it will fill. If it doesn’t fill then just cancel and correct it again for a slightly lower credit. If it doesn’t fill, repeat for a lower credit. Obviously you don’t want to take all day to get the trade done. However in the long run it pays not to be too impatient with this approach, because over multiple trades the savings will add up. The following is a general trading tip that admittedly only have our own experience to go on, but seems to hold true so far. We have noticed that option spreads in these less liquid currency ETF spreads (like FXB) tend to be a bit wider on the open between 9.30 and 9.45 and the close between 3.45 and 4. The guess is that market makers in these currency ETFs would like to get paid a bit more for hedging the illiquid option risk, especially overnight currency moves are digested. So it is typically easier to get slightly tighter fills on iron condors between 10am and 3pm, and we like to use 11.30 to 1pm (NY lunchtime) because on average the market seems slightly quieter. After 30 days in this Brexit trade is reached we can start looking at profit targets. Typically would look to buy to close the entire iron condor by entered a good til cancelled limit order – that will get triggered at say $2. That would give about $2 profit. Even after 30 days the options will still have about 60 days to option expiration, so this is primarily playing a volatility collapse, not time premium decay. 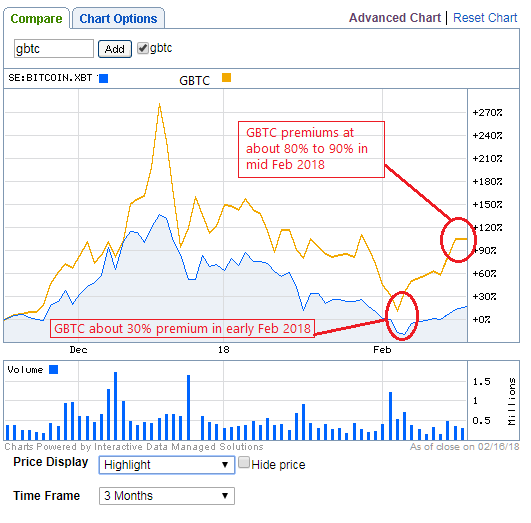 The volatility will likely collapse after the announcement so option premium should decrease significantly. Option volatility reduced on Monday as the market perceives that Brexit is less likely. Risk assets (equities) rallied an fear assets (precious metals) declined assuming that a “Remain” vote was priced in. Additionally the pound rallied 2% against the dollar. The lower option premium makes this trade less interesting now than last week. But interestingly the option volatility adjusted down significantly before the announcement (not on the announcement as we initially anticipated). However volatility could pick again after the announcement, but it is most likely to reduce significantly from current 25% implied volatility towards the last years average of about 10%. If this predicted option implied volatility collapse occurs it will help out our trade (even if the actual price moves against us). Trading futures options vertical spreads and futures calendar spreads can have their own nuances when the trade gets close to expiration. 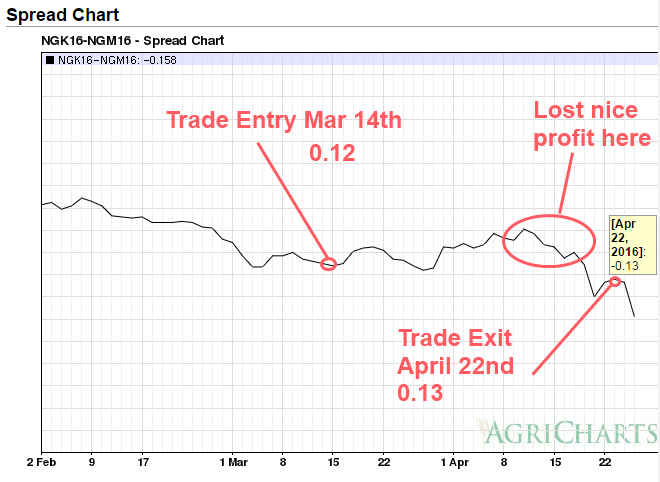 Here we look at some real life examples from our Natural Gas /NG trades in the past few months. What happens when both legs of a natural gas spread trade expire in the money at expiration ? Unfortunately in our case here this was full loss on a bull put spread, however given that the natural gas /NG price moved about 14% against the position, we are grateful for the protection afforded by the spread to limit the loss. Both legs of the bull put spread got assigned into their respective futures positions at the option strike price, then they immediately get liquidated because they cancel each other out. This is literally buying and selling the same futures contract at the same time at two different prices. This results in an instant profit or loss, depending on what the spread was. The following trades highlighted in red show this exact process. Note that the trade times are all identical, because this was instantly matched by the futures clearing system. Although the future is assigned to the underlying commodity, these are options on futures that settle to the futures. Importantly the options expire a few days before their underlying future does. This gives you a few days so you don’t end up the proud owner of 10,000 million British thermal units (mmBtu) of Natural Gas! There are several important dates: option expiration date and futures expiration date. On option expiration if your option is in the money, will be assigned into the futures contract. If you own the underlying future on the future expiration date and it is NOT cash settled, then you could theoretically be made to deliver or receive the contract amount of the underlying commodity. In practice many brokers will monitor their clients positions and start contacting you if you have a commodity futures contract that requires physical settlement expiring in the next week. For example Interactive Brokers will email you 7 days before the futures contract expires to remind you of your responsibility. They additionally point out that they will liquidate the position on the final trading day if it looks like you are in danger of taking physical delivery. Obviously for something like natural gas that is (probably) not desirable. However it is conceivable that someone might wish to talk delivery of precious metals, but most future brokers won’t let you. 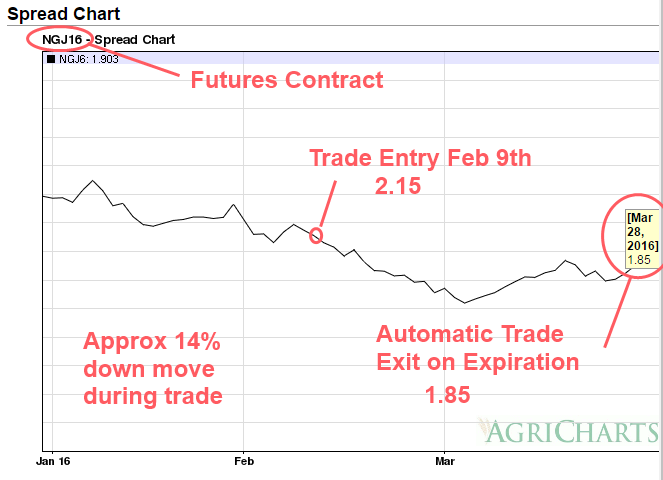 Futures Calendar spread are buying one futures contract in one month at the same underlying, then at the same selling the same underlying futures contract in a different month. Typically “buying” the calendar spread is short near month, long far month. “Selling” the calendar spread is buying the near month and selling the far month. Typically being long the near month implies a bullish position on the underlying price. Being short the near month implies a bearish position in the underlying. With a futures calendar spread you are looking for it to move in a particular direction. The actual credit or debit received isn’t at relevant as the value you can take it off for. You are literally playing the near month contract against the far month contract, as a relative trade. That is of you are bullish you are betting that the near term contract goes up faster than the far month contract. Obviously they will be correlated and almost definitely move in the same direction, but you are playing the rate of change in the spread between the two contracts – basically a very highly correlated pairs trade but that can still move enough to profit. Traditionally this is seen as a less risky way to express direction on an underlying. For example a natural gas futures contract for the near month could have a range of $5k a month, but the spread would only move up to $1000. This is reflected in the margin for a calendar spread which can be only a few hundred dollars, so the return on capital can be very good, even if the risk is controlled. Also calendar spreads seem to see wilder less predictable swings into expiration. These do not always reflect the original trade result, even if the underlying moves as you actually expected. Usually a long near month, short far month futures calendar is typically bullish the underlying. For the example the following chart shows a recent /NG calendar, that was originally trading nicely with our original bullish intent up to about a week before expiration. Then the spread suddenly reversed course, even though the underlying near and far month natural gas price went up. The differential between the near and far month changed from as expected in the early part of the month, to significantly inverse in the last few days. This actually ruined a profitable trade very quickly which was unfortunate. Moving from $360 profit to $110 loss (that could have been worse it went as low as $360 loss before we traded out of it). It is important to note again that the underlying price went up, which is what we were hoping for – yet the spread reacted opposite to what we expected. Lesson learned : take a spread profit when it is there, and don’t hang around too long into unpredictable expiration to squeeze out the last little bit of profit. BTW – This chart was created after our trade has expired using this free historical future calendar online charting tool. This is really useful for checking historical performance quickly, especially to observe historical future calendar spread behaviour into expiration – so you know potentially what to expect in the future. The liquidity for futures contracts typically dries up a lot in the last few trading days of it’s life. This is typically because many traders have rolled their positions to the next futures month. Combine that with the threat of broker liquidation at unfavorable prices, there is typically not much to recommend trading the final 5 days of a futures option or future contract. This post describes a medium term trade betting that the pound will trade lower on uncertainty into the June 23rd UK referendum on whether to exit the European Union (EU) – dubbed Brexit by the media. The trade is to short Great British Pounds (GBP) using 3 Micro GBP /M6B futures in Jun 2016 (symbol /M6BM6), and long Euro (EUR) using 2 Micro EUR /M6E futures in Jun 2016 (symbol /M6EM6). Each side has a notional value of approximately $26k USD. The 3:2 ratio is simply chosen so that the notional amounts are identical, because of the different contract sizes for each currency. 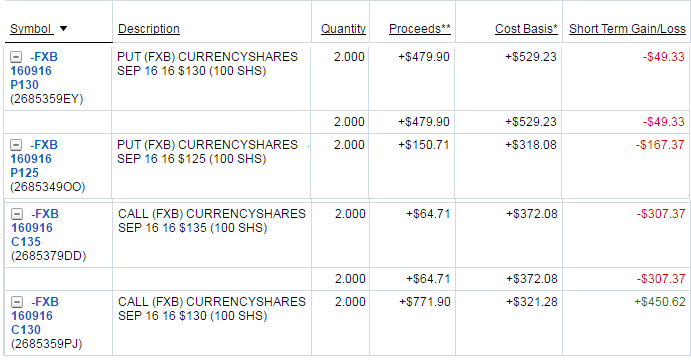 Trade entry was 14th March. This idea was from an FX Crosses trade idea from tastytrade.com, but one that we think we can use within our 30 day Rule restrictions. Typically this would be a scalping trade for few hundred dollars over a day or so, but we will attempt to position trade for a month or more. For the record personally don’t think that United Kingdom (UK) would vote for an European Union (EU) exit, but with numerous exit polls and political statements along the way there will be a lot of uncertainty into the final results announcement on Jun 2016. However we don’t think we have a crystal ball so our personal opinion is not really relevant, therefore trade will be exited early and not wait for final result. This is trade is focused on the expectation of uncertainty into the result not the final result itself. This is a trade to “buy the Rumour, sell the news” trade or more accurately – because part of trade involves shorting pounds – it should be “sell the Rumour, buy back before the news”. The GBP EUR pair has a very tight correlation of about 0.71 in the last year. So what does that mean for our trade ? To recap correlation values typically vary between -1.0 (negative) and 1.0 (positive). A highly positive correlation means that the two products will typically move in the same direction mostly of the time (S&P 500 ETF (SPY) and Nasdaq (QQQ) would be a good example). A highly negative correlation means that the two products typically move in the opposite direction most of the time (S&P 500 ETF (SPY) and Volatility (VXX) would be a good example. Typically you would be looking for pair trades that were either below -0.5 or above 0.5 – because anything in between that range does not give enough of a correlation pattern (it could just be considered noise). For the following we are using the relative charts of the ETFs FXB (Pound) & FXE (Euro) to show daily moves over a monthly time frame. For our high level correlation analysis, these E-micro futures move almost identically to these ETFs, so they can be considered equal for this analysis. Apart from general market risk, the FX market experiences higher implied volatility and rapid directional moves around central bank announcements. The FED announcement on March 16th and BOE announcement on March 17th will affect this trade. This trade was not made delta neutral into FED meeting on March 16th. This is because the direction of euro and pound will likely be the same, even if the actual direction is unknown before hand. This trade does not make money guessing direction correctly, it makes money assuming the Pound under performs the Euro in the next month or so. Typically the euro and pound will trade in the same direction, but because we are long/short as a pair in the same amount the direction risk is minimized. It is possible, but not very likely, that the Euro and Pound trade in opposite directions after the FED announcement. However this trade was made delta neutral before the BOE meeting on March 17th. This was because this is event directly specific to one of the currencies in the trade pair. Remember the aim of the trade is to express the view that the Pound will be weaker than the Euro over the lifetime of the trade into a potential Brexit – however trading central back announcements is just a trade outcome that cant be easily predicted and FX rates react in a very binary way (up or down very quickly). Since this event has the potential to move the GBP side of pair significantly, this introduces unnecessary event risk into our pair, so we will neutralise the trade for the event, and then re-evaluate afterwards. The trade was totally hedged the night before the event, by purchasing about $26k GBP/USD spot FX and selling about $26k EUR/USD (the exact opposite of our futures position). We cannot exit any trade legs immediately due to the 30 day rule. At luck would have it, after the BOE meeting at 8am EST on March 17th, GBP moved rapidly higher (i.e. against our original position). By 4pm Thursday compared to 24 hours earlier before the BOE announcement (but after the FED announcement) GBP was 1.53% higher and EUR was 0.76% higher. If we had remained unhedged in the original futures only position into the BOE announcement, this would have lost approximately 0.77% of our trade, or would have lost about $200 of our unrealized $350 profit. However since the trade was now totally delta neutral so our unrealized $350 profit remained, because the spot FX positions exactly offset any movement in the micro futures (as expected). Since we have a locked in guaranteed $350 gain, we may just hold the entire structure for a month due 30 day rule then exit with a gain. In future we would also probably just use GBP/USD or EUR/USD spot FX (standard FX trades) versus the Micro GBP /M6B and Micro EUR /M6E futures. Given that the BOE meeting was bullish for GBP we can simply hold this trade with no modifications. However in 30 days time we can reestablish this trade (if we still want to trade the potential Brexit) simply by trading out of the spot FX positions. Alternatively we can just exit all the legs simultaneously and take the profit. 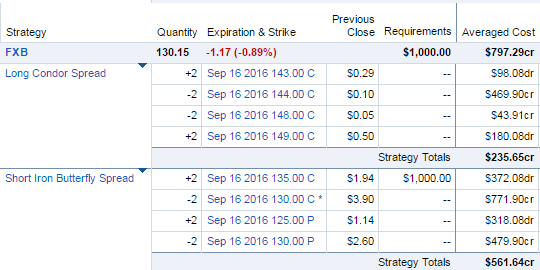 What happens when you get an option assignment exactly at the option expiration date on a short call vertical spread? If you don’t exit a short call vertical spread at option expiration and it closed the middle of the strikes, then you will get assigned on the short call creating a short position the next Monday. This position was accidentally created on Feb 19th trying to exit a FXE short call vertical spread 107/109 spread, that ultimately closed in between the two strikes. 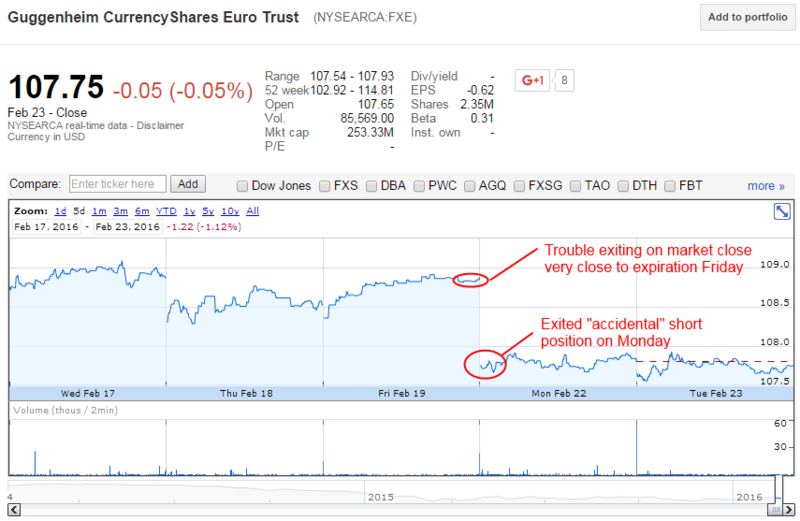 FXE is the ETF that tracks the euro to USD exchange rate. It replicates the EUR USD exchange rate with decent liquidity of about 750,000 shares a day for the ETF and options that trade with penny wide option pricing. To make it slightly more complicated this trade was in an IRA account, and brokerages do not allow short positions in retirement accounts. Important: You should contact your broker before market open if you got assigned like this in a retirement account like an IRA. This is because your brokerage might take matters into their own hands, i.e. liquidate the short position for you without asking, potentially with a market or in the illiquid pre market with poor pricing (they are within their rights to do this because you are temporarily at least breaking the rules). In extreme cases the broker might also liquidate other positions if your cash balance is very low. You generally must try and buy to close out the short shares as early as possible in the morning session (preferably in the first few minutes of the session). Therefore it would be advisable to contact your broker on the phone before market open to explain the situation. This is because you are not allowed to have a short position in an IRA – if you show willing with your broker that you did your best to try and get out of it that will help your position. Technically it might be possible to hold until the end of day, but as soon as you have a closed overnight position it would should up as a short position at end of day settlement. Original intention was to exit a FXE call vertical spread 107/109 call spread on the last 15mins of trading day on Friday. In the last hour on trading on Friday from 3pm to 4pm FXE price ranged from only 108.83 to 108.88, so fair value for the spread never ever more than 1.88 and got as low as 1.83. Placed limit orders to exit at a mid price of 1.85, 1.90, 1.95 up to even 2.0, but never got filled in the last 5mins of trading. That means no one wanted to take the other side of the spread when expiration was only minutes away, even at $0.10 over fair value. It never actually occurred to us that would not be able to get a fill at any price (!). At 4pm market closed with no fill and obviously day limit order for our trade exit was cancelled automatically on market close. Therefore we were forced to hold a net short position of $21,400 over the weekend, assigned on 2 options contracts at $107 (2 x 107 x100 = $21,400). Being short a currency over the weekend is typically not as risky as the stock market, because currencies tend not to move as quickly as equity markets and FXE has been fairly range bound in the last month from approximately $106 to $111. So was not so worried about the open market risk, more the actual exit execution with Fidelity (which actually turned out ok, with the caveats given below). FXE only trades US market hours like a standard ETF, where as obviously the currency trades 24 hours x 5 days including overnight. So if you can not get a pre market quote on a currency ETF like FXE, you use a currency trading website like dailyfx.com to track the actual euro price and work out almost exactly where FXE price should open on 9.30am on Monday. The currency chart price does not exactly match FXE price, but you can work this out as follows. Take the closing price on 4pm Friday close from the currency exchange rate chart (1.113) and current price now (1.101 on Monday about 9.30am ish), and work out the percentage change (1.101 – 1.113)/1.113 = about -1.08%. Then taking the FXE closing price from Friday (108.88) apply that percentage change by to give an approximate open value for FXE of about $107.70. We were fine exiting at that price since it was about break even for the original spread position, especially because the option spread was almost a full loser on Friday. For record the actual executed FXE trade price was $107.75 (including commissions). Since on Monday Euro was down 1% in the morning on the NY open with a mini crash in progress on news of Brexit, we just covered with a market order. Normally we would use limit orders not market orders for exiting stock positions. However our broker (Fidelity) not being able to process a limit order without ringing up every time to cancel and correct it, and then they have to read the entire order back to you over the phone (due to option trading regulations). Cancelling and correcting say 10 times over the phone to get try and get a better fill over the phone is somewhat tedious and would have taken about 30 mins and given the market was moving quickly just decided to take advantage of the move lower on the open. Incidentally Fidelity fee for ETF trading directly with a trader on the phone is $32 (!) – fortunately they waived it as this was a “special case”. 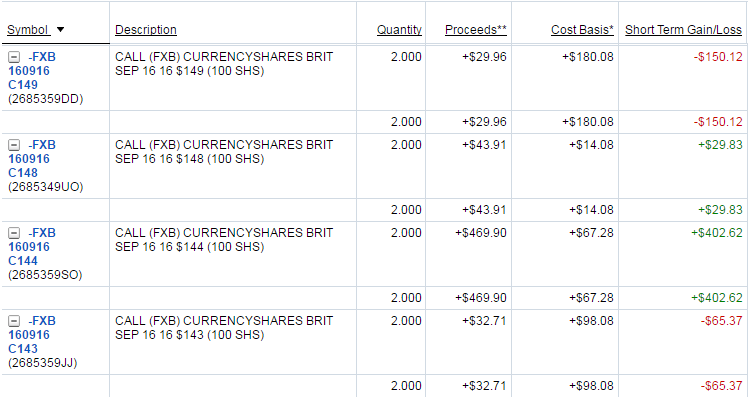 You cant be short stock in an IRA, so it was important to close out the position on Monday. Not sure what would happen if position was held onto for a few days, but its probably not a good situation for your account (Fidelity rep on the phone said Fidelity compliance would call, and enforce liquidation of the position or request significantly more cash to back up the short position). So in summary, a short position can be created in an IRA if an option assignment on a ITM short call spread occurs at option expiration. However if that does happen, it is definitely not a good idea to hold it more than one trading day because it violates IRA brokerage rules. It also may vary with how your broker would handle that in an IRA. 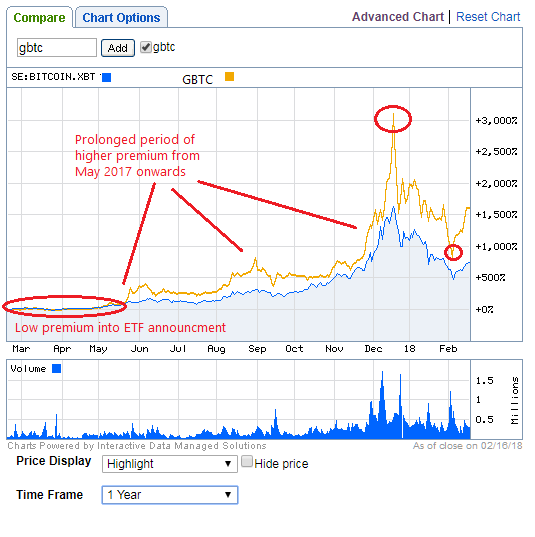 For example Fidelity allowed trading out of it, but had to call in to manage that – however other brokers might have issues with that situation. In conclusion it is generally best to avoid getting into this situation in the first place, by not waiting until the last minute to exit and actively monitoring all your positions in option expiration week. Fortunately having done it once, you are not likely to do it again in hurry!